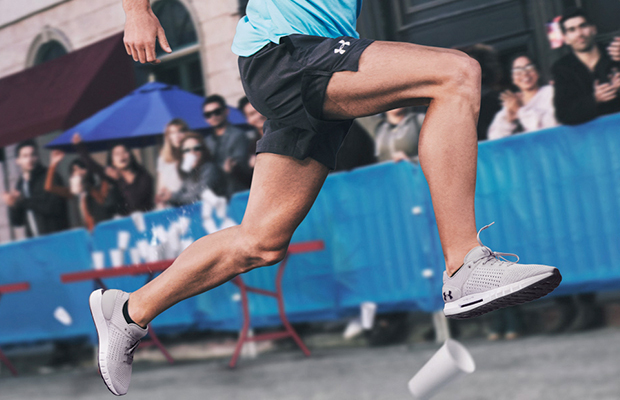 Cushioning comes alive with every stride in the latest from Under Armour. Under Armour had us at ‘HOVR’ after unveiling its footwear cushioning technology earlier this year, focusing on the HOVR Phantom shoe. This time around? – The focus is on the longer distance shoe, the HOVR Sonic. The HOVR Sonic is made for the longer distance runner, providing cushioning with every stride. The HOVR technology makes every stride light and effortless allowing the runner to go kilometre after kilometre effortlessly, while maintaining energy and eliminating impact. The HOVR Sonic has reinvented comfort. The HOVR Phantom is made for the shorter distance runner, the 5K specialist. With the Phantom absorbing some of the impact that your body would normally feel, aiding in your comfort and keeping your legs fresh for the road ahead. HOVR is UA’s third cushioning platform, in addition to Micro G and Charged Cushioning. This pinnacle cushioning system delivers on runners’ needs to have a shoe that provides not only support but also energy return and shock absorption. Another key component of the HOVR technology is the ‘Energy Web,’ which is a comprehensive mesh web that contains the cushioning core, helping to maintain the midsole’s shape and, in return, delivers strong responsiveness and energy return. This combination of advantages make you feel better and perform better. The HOVR Sonic is available for purchase from August 1st 2018, retailing for R2299 and the HOVR Phantom is retailing for R2799 at Under Armour Brand House stores in Mall of Africa, Sandton City, Menlyn Mall, and V&A Waterfront as well as select Totalsports and Sportsmans Warehouse stores. To win a pair of HOVR Sonic or Phantom running shoes, simply answer the question below! **The competition entry form has been removed as the competition is closed. Competition closes on Sunday, 19 August.